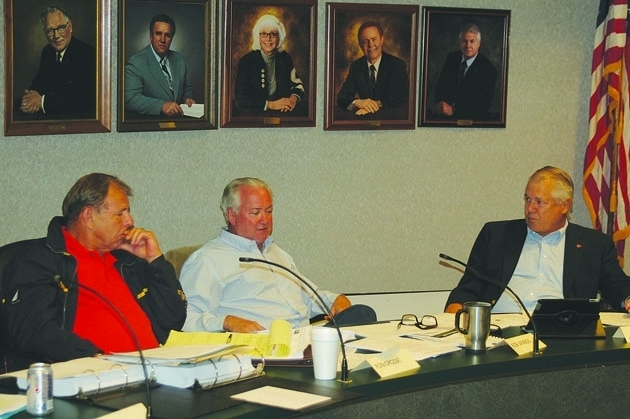 Robert Jambois, center, seen here working on the Middleton Board of Review. After graduating 6th from the bottom of his high school class, Robert Jambois didn’t think a professional career was in the cards. The now-lauded attorney spent his late-teens to early-twenties working at gas stations and picking up other manual labor jobs. Until one day, a brush with injustice landed Jambois in the midst of a small claims case. “When I quit a job building motors, the guy I was working for kept an engine,” stated Jambois. Furious about this wrongdoing, Jambois channeled his frustration into legal action. He pursued a lawsuit against his former employer in order to both recover the stolen item and prove a moral point. “I lost,” Jambois said with a humble laugh, “because I sued him individually instead of targeting the corporation.” The lawyer representing his old boss approached the young Jambois after the trial and offered him a bit of guidance. “I know you’re very disappointed. But this is a life lesson and you need to move on,” he advised. Little did that defense attorney know how Jambois would apply this piece of wisdom. The disheartening experience only served to motivate Jambois, compelling him to go to college with the ultimate goal of attending law school. Decades later, Jambois, now an experienced lawyer with District Attorney credit under his belt, found himself entrenched in another David and Goliath-type scenario. Except this time, Goliath was not an engine-stealing crook, but a state governor. Jambois seemed to stumble deep into the throngs of a historic moment by accident. He and his wife, Bev, are members of the Middleton Action Team, a local progressive-minded group, when Governor Scott Walker GOP state lawmakers introduced Act 10, prompting historic protests from those who believed the act amounted to union busting. As thousands gathered around the State Capitol voicing their opposition to Walker’s policies, the sheer volume of demonstrations garnered extensive media attention and served as the driving force behind an ultimately unsuccessful recall effort. Protesters spoke up, fought back and as a result, landed themselves in some form of trouble with the law. Police officers began issuing tickets to political activists left and right, creating a significant need for legal aid. Offering a few informed thoughts turned into an inundating caseload for he and his wife’s small practice. Even two years later, the demand for legal counsel remains steady. Although more than 60 protester ticketing cases have been dismissed, more continue to pop up for activists engaged in the daily Solidarity Sing-Along at the Capitol. Considering that Jambois does not identify as much of a social justice crusader, or particularly liberal for that matter, his involvement in the Wisconsin protesters’ fight seems like something of a fluke. Yet, Jambois’ dismissal of any progressive kudos cloaks stands in contrast to friends and citizens he has helped. They say he possessed an admirable sense of righteous indignation for threats to justice. While a desire to protect fundamental freedoms pushed Jambois to get involved in this battle, when asked where he thinks the protesters’ fight is headed, the Middleton attorney offers a measured response. Jambois’ days of small claims cases may be behind him, but his advocacy for the Wisconsin protesters goes to show that alleged abuses of power irk the Middleton resident.